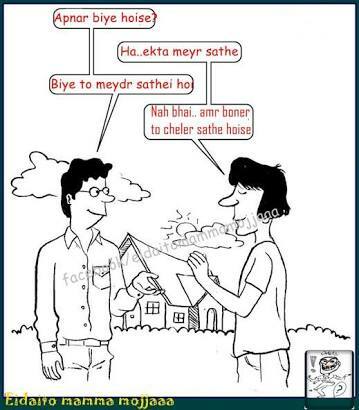 Sir-Boloto A Prithibite Sob Chye Chalak Prani Konti? 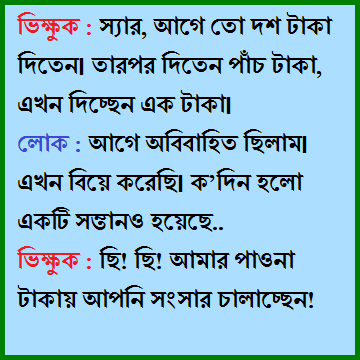 Studant-Goru Sar,Sar-Ki vhabe?Studant-Sar Kothay Ache Na Oti Chalaker Golay Dori,Tai Gorur Golay Dori Thake Sar Thahole Chalak K Holo Sar. hasbend onekkhon dhore ekta kagoz porsen... wif:eto mon dia ki porso! has:koy! kisu nato! wif:na mane! tumi goto ek ghonta dhore amader Marrige Certificet porso, beparta ki? has :na mane ami etokhon dhore etar expire date ta khujsilam! Eid opulokkhe Meyeder jonne darun offer.Registation korte apnar Matro 221tk vat shoho charge.R deri na kore Romna parke Ese amar Du gale Du ta kiss kore apnar valobasa successfull kore nin.R kiss korar 21 din pore apnar Phone confermition SMS chole jabe. Medical teacher, manus oggan hoye gele prothome thote mukh lagiye fusfuse batas oksijen dokanor chesta korbe r buke chap dibe.boltu:sir meyeder oggan korbo kivabe seta taratari bolun. 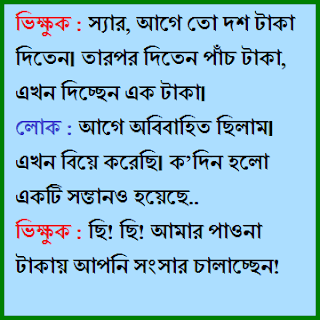 Meye-Sar Ato Din Hoye Galo Apni Amak Porachen Apni Ki Amr Chokher Dike Takiye Ak Baro Ki Bujte Paren Na Amr A 2 ChokhE Ki Lekha Ache.Sar-5 Bochor Hoye Galo Akhono Thik Moto Tor Hater Lekha Ei Bujte Parlam Na-R Tor Chokh? ami jani tumi bolbe ami kemon achi , ki korbo? Tomay chere mosa niye beche achi, uh! 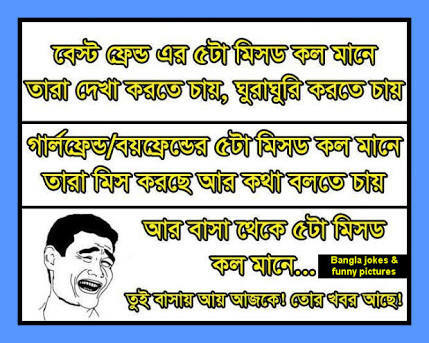 Mosar kamor soite pari na ,jekhane sekhane kamray marte pari na . 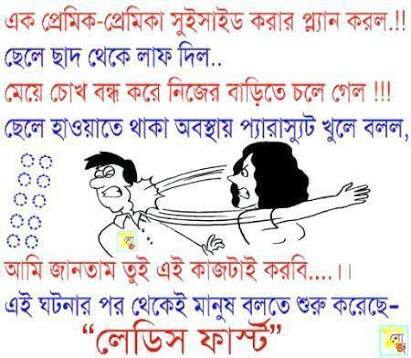 Poli Tar Boyfriend Bose Golpo Korce,Amon Somoy Polir 3Bandhubi Ase Hajir,Bandhubra ? Korlo Tina Ata K Re?Poli-Amr Vi.B-Kmon Vi Re Cha cha To?Poli Na,B-Mamato?Poli Na.B-Khalato?Poli Na.B-Fubato To?Poli Na.Bandhubira Rage Giye Bolbito Ki Vi Hoy Tor.Poli-O Amar Valobashato Vi. Biye Kora R Mobile Kenar Por Ki Afshos Hoy Janen? ?Is R Kichu Din Opakha Korle Ar Chye Valo Model Pawa Jato. Boy:ki koro jan. Girl:ghumiye achi. Boy:swopno pathaw. Girl:ja dusto swopno pathabo ki kore. Boy:tahole ami pathaie. Girl:ki koro R ki pathabe. Boy:hagu kori guuuu pathabo. Girl:owak thuuuu c c c? 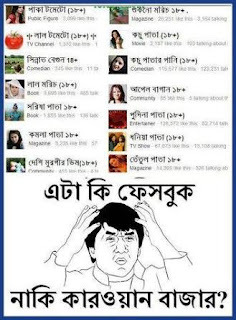 Pramik-Premikar Modhe Kotha Hoche,Pramik-Ami Mone Hoy 2make Biye Korte Parbo Na.Premika-Ato Din Por A Kotha Bolco Kn?Ki Hoyece Boloto Suni.Pramik-Na Tamon Kichu Na Amr Basa Theke Nised Ache.Premika-Ta 2mr Basay K K Ache.Pramik-Basi Na'Amr Ak Wife R 3 Sontan Ache. 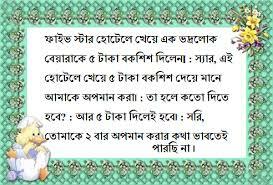 MALIK:BA Abuler hater tee to bes valo hoiasa.ABUL:Ha babu biral a jode dud a muk na d to tahola r o sad kulto. Dakheci Prothom Bar Murgir Moto Chahara 2mr,Koto Je Asa Cilo Amr 2my Niye Khulbo Khamar,Parbe Je 2mi Sada Dim,Sei Dim Bache Kinbo Ami Robi Sim. Wife-Amr birth de Gift Koi,Husbend-Rastay Dike Takiye Dakho Akta Lal Kalarer Gari,Dakte Pacho?Wife-WoW 2mi Ki Valo,Husbend-Sem Kalar Nelpalish Anci 2mr Jone Gift. Boy: I Love You, Girl: vodro vabe kotha bolo! Boy: Bismillahir Rahmanir Rahim *with Due Respect I beg to say that.... &quot;I LOVE YOU&quot; Girl: Ki?...! !